I was looking on Instagram today for inspiration to write. It seems I’ve written about so many different topics and I got a little bit of writers block! Sometimes it’s hard to keep writing this blog; especially if, say, you haven’t been too busy the past week! Anyway. 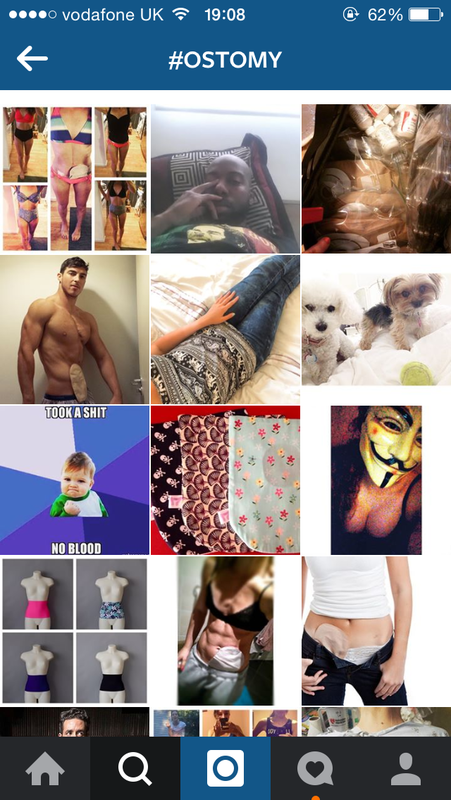 As I was saying I was searching on Instagram today, and for the first time typed the word ostomy into the search bar. Before I know it, thousands of photo posted under the tag “ostomy” appeared on my phone screen. I was seriously amazed at how open other people were being. So many people sharing their journeys, so many people I felt I could relate to. And, for those of you that use Instagram, I thought I’d just mention a user I feel would be helpful to others in a similar situation to me. This person is truly inspiring, and will continue to amaze me I’m sure as I follow their journey through imagery. @zoeywright10 is a female body builder with an ileostomy. She takes every ounce of stength she has and puts it towards a passion. She looks absolutely incredible and it just goes to show a chronic illness need not hold you back. Anyway, I hope everyone’s well. I’m suffering with my UC at the moment – my joints are achey and my fatigue is awful! But I have invested in some zinc, iron & B12 supplements so I’m hoping to get it all under wraps soon. :-). Anyone else tried anything to beat fatigue? I’ve Gained Two Stone & An Ostomy Bag But My Stomach Looks Flat Because Of This! And I think I rock my bag. These pics are great!